Winter weather takes its toll on all living things, and winter plant protection is essential for the serious gardener. From taking tropical plants indoors to covering strawberry plants with mulch, learn which winter plant protection methods are best and when to use them. The goal of winter plant protection is to mitigate the harsh effects of winter weather. It's not just snow and ice that harm plants. Cold winds actually sap the moisture or desiccate delicate leaf tissues. 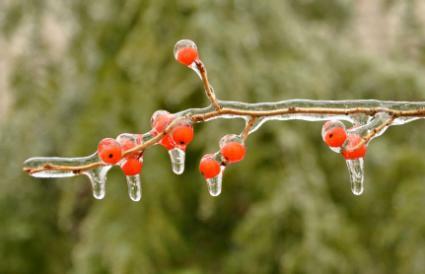 Freezing temperatures can freeze the liquid within plant leaves, causing destruction to the leaves or death to the entire plant. The see-saw like effect of freezing and thawing cycles may also causing the very earth to move around the roots of plants, pushing them out of the soil. To protect plants, choose one of the following methods. Some plants cannot withstand cold outdoor temperatures no matter how much care you give them. Tropical plants and most houseplants fall into this category. Annual plants that require warm weather such as impatiens, coleus and many vegetables cannot withstand any cold temperatures, so your best bet is to simply let nature take its course and plan to purchase them again next year. For houseplants and tropical plants, bring them indoors as soon as the cool weather begins. Be sure to wash them down thoroughly with the hose and inspect the pot, including under the rim or lip of the pot, to remove spiders, egg sacs, and other insects that may be shelter on the plant or pot. Plants in large pots or containers that may go dormant during the winter, such as trees, may be moved into a covered location such as a garage. Water only occasionally, and not too much or you will encourage the plant to break dormancy before the weather is ready for it. A cloche is a bell-shaped glass or plastic cover placed over an individual plant. Used for many years in kitchen gardens to shelter tender herb and vegetable plants, cloches are simple to make from old soda pop bottles. Peel off the label, clean it thoroughly, and cut the bottle so the spout is removed, leaving as much of the main cylinder as you can. Slide this over tender herbs such as rosemary to protect it. Be sure to use a rock to weigh it down. Floating row covers form a mini cold frame over a plant bed. They're frequently used in vegetable gardens to extend the growing period and may be enough in some gardening zones to protect plants during the winter. A frame made of PVC pipes or another material is placed over the bed and a plastic cover extended over the row. Mulch is one of the best materials to protect plants from winter weather. Mulch insulates the roots and mitigates the effects of freezing and thawing cycles, preventing heaving. It also breaks down over time and adds vital nutrients to the soil, if an organic product such as wood or straw is used as a mulch. Certain fruit crops such as strawberry plants benefit from a good cover of straw mulch. The harsh winter winds can damage shrubs and trees. A wind break consists of a burlap, plastic or other material stretched over stakes driven into the ground. The purpose is to keep the prevailing winds from directly blowing on and damaging shrubs or plants. Netting may also be stretched along the poles. It allows good air circulation but keeps enough wind off of the plants so they remain healthy. Many gardeners in recent years have turned to native species of perennials, grasses, shrubs and trees for their gardens. Not only do these plants tend to need less water, they are also better suited to withstand the winter conditions for the area. Nature acclimated them over the centuries to the growing conditions of their native area, and they need less winter protection than non-native species. Use your common sense. If the weatherman predicts a storm or hard frost, take steps early to protect your plants.